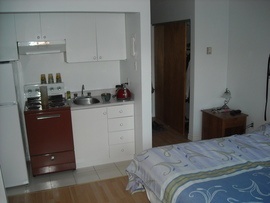 A small kitchen area, such as in hotels or studio apartments, usually consisting of a mini fridge, hotplate or microwave, small sink, and some cabinets. The cost to install a kitchenette varies widely depending on what is included, what materials are used, how big it is, and whether the plumbing and electrical connections are already available. It can range from $5,000 to $15,000.